If you have children, you know about the incredible allure of the garbage truck. When “garbage day” rolls around, the kids excitedly listen for the low rumble of the local garbage truck. When the big moment comes and the garbage truck rolls up to the house, children can be found gathered at the window, or standing in the front yard, waiting to watch the magic unfold. When that big, dirty, stinky, beautiful green garbage truck pulls up to the house, kids stand in awe of its enormous presence. 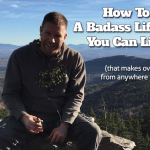 The garbage man steps out, hero in a child’s eyes, and gives a wave hello. The kids break out in smiles as they watch him work. Toy garbage trucks make wonderful gifts for younger children. Toddlers love to play with garbage trucks because they can simulate the excitement they look forward to watching each week. Pre-school aged kids and younger children are at the age where they can begin to imagine what they might be when they grow up and “garbage man or woman” is a popular choice. Kids love jobs that are straight-forward and concrete, and collecting garbage in a big truck is a child’s dream come true. Encourage their imaginations with a toy version of the garbage truck they so love to watch in action. You may be surprised to find that there are a great number of toy garbage trucks to choose from. 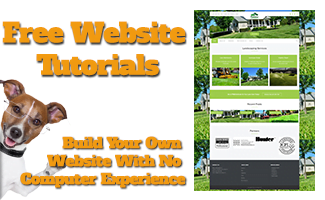 There are front loaders, modeled after the garbage trucks that pick up dumpsters, and rear loaders, toys made to replicate the garbage truck that you might see in your neighborhood. 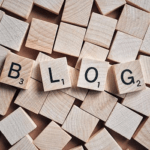 We researched numerous brands, models, and sizes of toy garbage trucks and were able to compile a list of the top 15 on the market. Read through our “Top 15 Toy Garbage Truck Guide” to find the perfect gift for that special little one in your life. This toy garbage truck from WolVol is one of the coolest on the market. 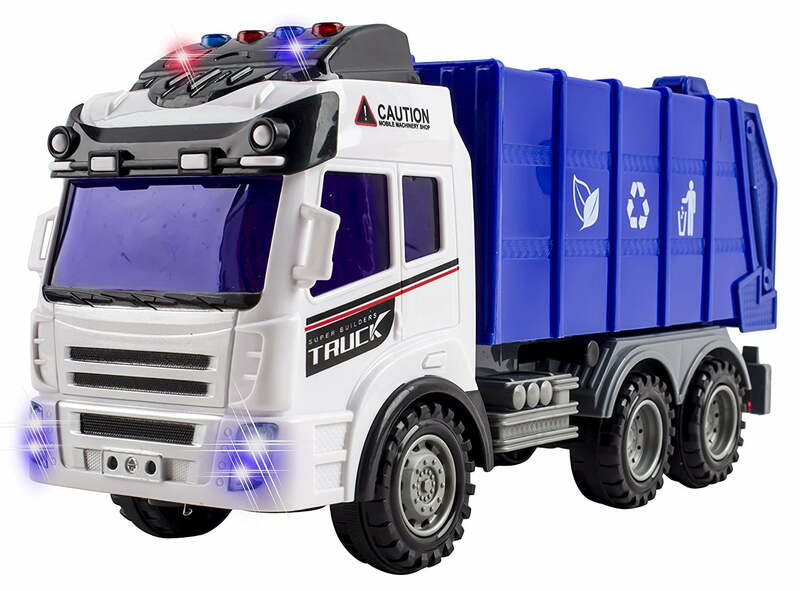 This friction powered, rear-loading toy garbage truck comes fully equipped with lights and sounds. With just a push of a button, a child can lift up the back loader and use it just like a real garbage truck. Kids love that you can actually put trash, or anything small, in the back of this truck. This WolVol truck is friction powered which means it will run when you roll it. 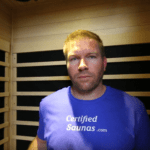 You want bells and whistles? This truck has ‘em. It is equipped with lights and real truck sounds. The best part? This six-wheeled toy garbage truck comes installed with batteries, so parents don’t have to worry about hunting down a screwdriver or buying batteries when it is purchased. Ideal for kids ages three and up, this toy garbage truck is ready to be play with, straight out of the box. 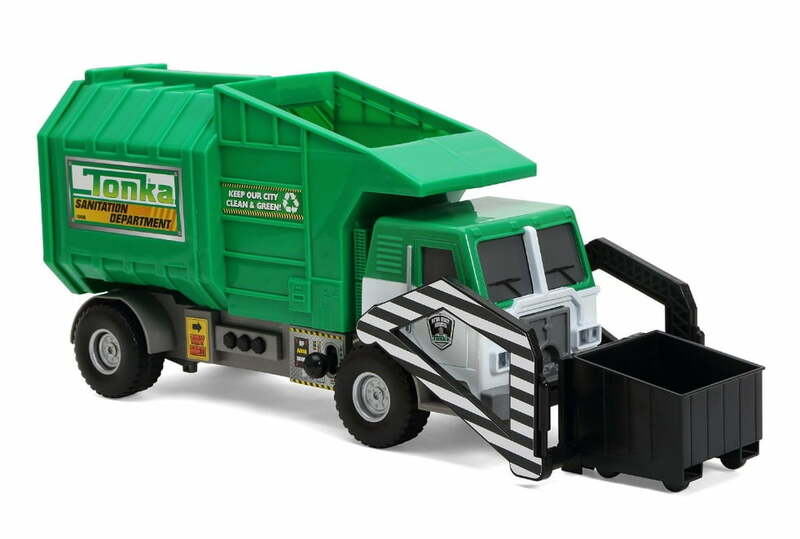 If your kid has an eye for detail, this toy garbage truck will surely be one of their favorite play things. Not only is this one of the elusive side-loading toy garbage trucks, it also comes with a compatible garbage bin that can be filled and then emptied into the truck. Kids can easily figure out how to use it, just like the real garbage man does, and have tons of fun placing the bin on the side hook, pressing the button to lift the bin to the top of the truck and emptying it into the holding container. 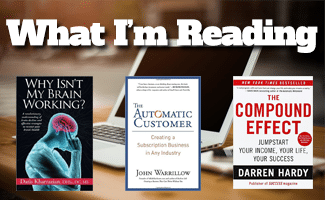 Ready to unload? With a press of another button, kids can use the back dumping feature, lifting up the holding container and dumping everything out of the back. This is a friction powered toy garbage truck so, with a gentle push from a little one, the truck will keep moving forward on its own. It is a decent sized truck at 14 inches long. 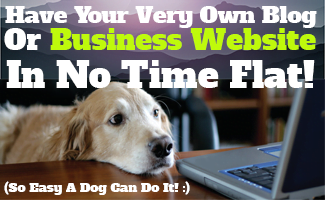 It is brightly colored, super realistic looking, and sure to provide hours of fun for young ones. This bright green toy garbage truck is the real deal. Made by Tonka, a toy company that does trucks best, you know this American made toy garbage truck is going to have some cool features. Using the levers on the side, kids can move the motorized front arm in an up and down motion. Not only do the mechanics of this truck work, it has a beeping horn as well. The back door of this truck opens and your child can smash trash and load it right inside their own garbage truck. It is 21 inches long and features incredible detail. This would make a great gift for a garbage truck loving kid. Even older kids love to play with this front-loading toy garbage truck. 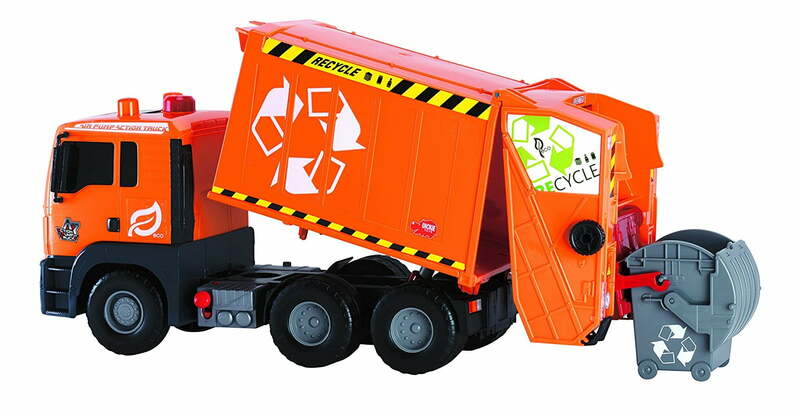 This isn’t technically a toy garbage truck but kids love this toy recycling truck just as much as garbage trucks so we have included it on our list. Geared toward kids ages four through ten years of age, this is more than a toy truck, it is an entire play set. 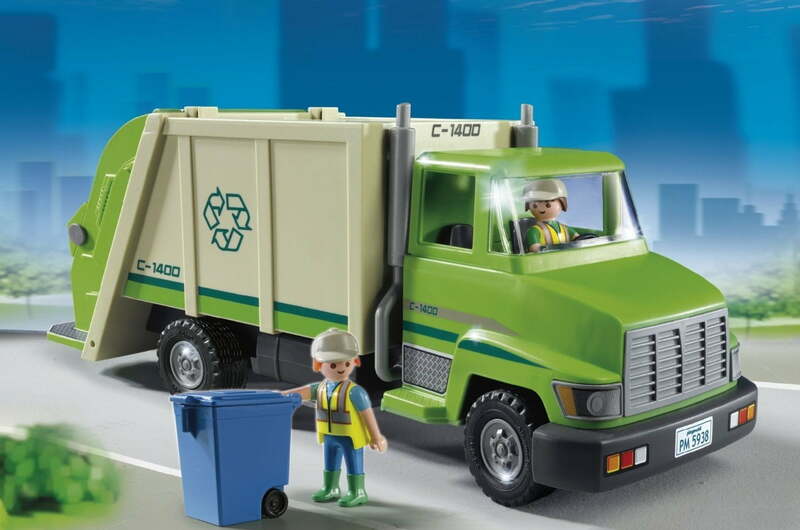 This toy recycling set from Playmobil comes with a big green toy recycling truck, two worker figurines, and plenty of extra accessories, including a blue recycling bin. 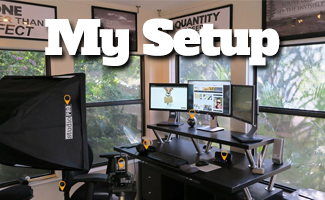 In total, this kit comes with 27 pieces, making it a great deal! The figurines are moveable- they can bend, sit down, stand up, and even turn their heads. You can even make these little characters “drive” the truck or hang off the back, just like real garbage men. The garbage bin can be set and lifted into the back, emptying out its contents just like the real thing. When you buy this truck, it comes assembled so no need for the headache of putting it together. 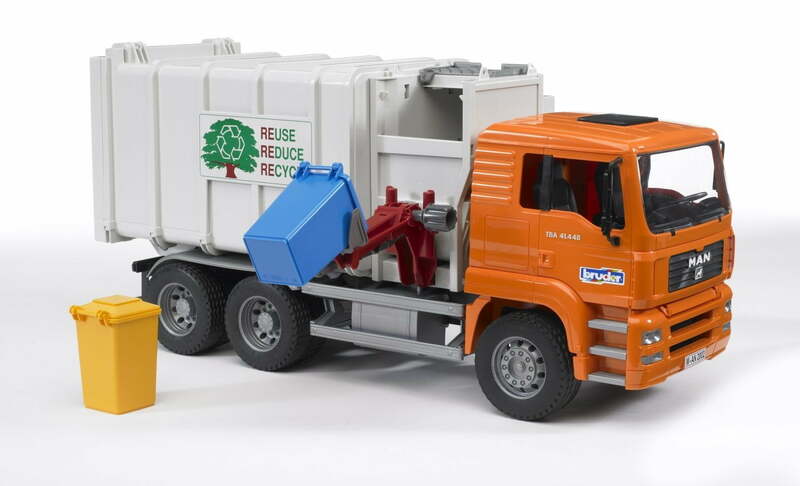 This toy recycling truck is a great deal because you get the truck, two garbage men, a waste bin, and small recycling pieces. For the parents who prefer that their children play with wooden toys, this toy garbage truck from Melissa & Doug is a perfect option. This is a three-piece set that includes the truck itself, a green bin, and some “trash,” all made of premium quality wood. 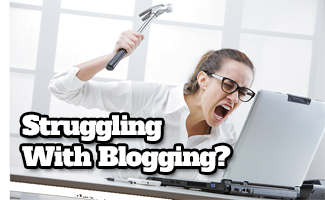 The truck itself is free wheeling and extremely sturdy. The back arm holds the trash bin and lifts it up, dumping the trash into the back. The truck’s chassis is solid wood, ensuring the durability of this toy garbage truck and making it easy for little ones to grab. The great part about having the “trash” in one solid piece is that children can lift, dump, and repeat with ease. This is a hand operated, classic toy garbage truck. In this case, less really is more as this toy encourages kids to use their imagination as they wheel this toy truck around, lifting and dumping pretend trash as they go. 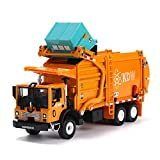 The New York City Sanitation Department Truck from Daron is one of the most realistic looking toy garbage trucks on the market. Made from die-cast metal, it is a 1:50 scale true replica of its namesake. The seven-inch-long truck looks just like the one kids in New York see rolling down the street., picking up city trash. This toy truck has real rubber tires and includes the pull back feature- when your child pulls the toy backwards it will propel forward on its own after they let go. The back part lifts the garbage bin up and there are several levers, one of which dumps and another that compacts the trash. The decals are carefully placed in the same place as the garbage truck it is modeled after. This toy garbage truck is so coo,l it makes an awesome toy for kids and a great gift idea for kids-at-heart. Green Toys has created an awesome option for toddlers and younger children who want to play with a toy garbage truck. 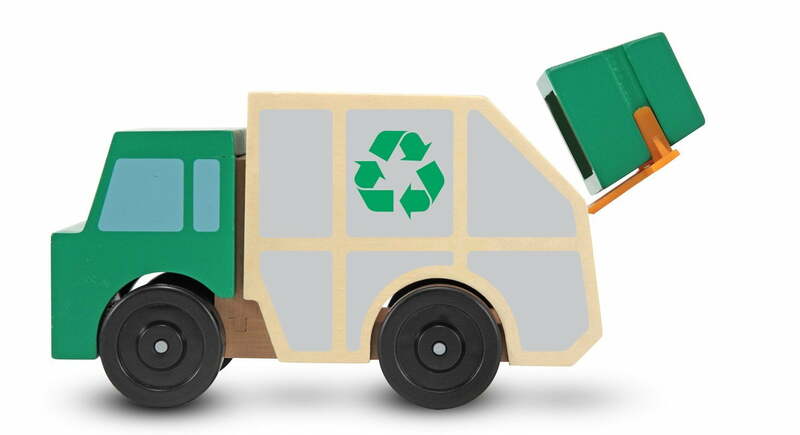 Safe for children 12 months and up, this toy recycling truck is a safe and healthy option for conscientious parents as it is made without BPA, PVS, or phthalates and is constructed from 100% consumer recycled plastic milk jugs. Even the packaging it comes in is earth-friendly, made from recycled materials and printed with soy-based ink, and, even cooler, the box is part of the toy. The packaging includes cardboard cutouts of commonly recycled items for your child to play with and put in their toy truck. Both sides of the truck have three shoots- one for bottles, one for cans, and one for paper. The truck bed easily tilts back and can be emptied so your child will play with it for hours on end. 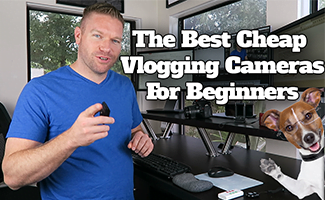 The truck rolls right along, as your toddler or child guides it with their hand. If your child takes this toy truck outside, that is not a problem. Green Toys specifically designed this model without metal axles so it is rust proof and dishwasher safe. If you are looking for a toy that incorporates your child’s fascination with the garbage truck and also stimulates their creativity, this toy garbage truck from Play-Doh is a great option. This front-loading toy garbage truck rolls just like any other truck but it does so much more. Your child can use any of the four included cans of playdough to load the back of the garbage truck then, as they roll the truck along, it “tosses” out silly garbage shapes like fish bones and bugs, in the wake of its path. 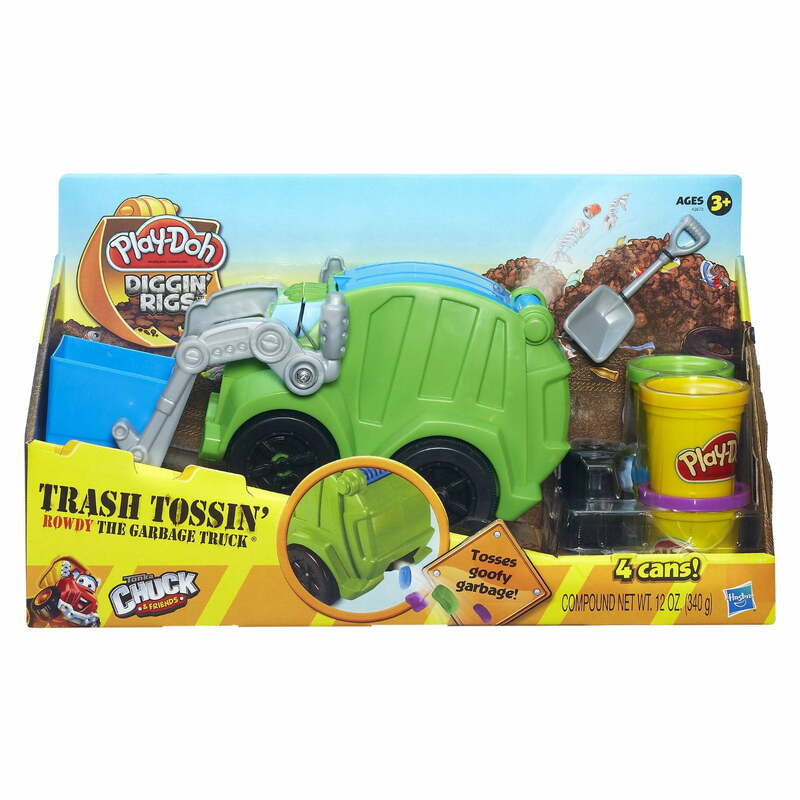 This toy set is priced right and includes a ton of cool stuff besides the toy garbag truck itself- a book mold, trash-can extruder with plunger, a bin, a shovel, and four cans of Play-Doh. Designed for children three and up, this set will provide plenty of afternoons of fun. 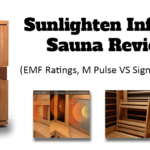 This lean, mean, orange machine will have your kids awestruck by all of its cool features and intricate details. 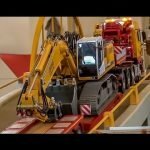 This toy garbage truck will properly demonstrate how a rear loading industrial garbage truck works. 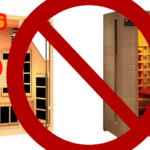 It even comes with its own appropriately sized dumpster. Thanks to this toy truck’s awesome air pump technology, your child can raise and lower the container to pick up trash, all without the need for batteries. Since this toy is powered on its own, parents save money on batteries and children are not disappointed because it never runs out of power. Shred up a bit of newspaper and let your children can use it as “trash” for this toy garbage truck to pick up. At 21 inches long, this is one of the larger toy garbage trucks on the market and, with its bright, bold coloring, it is sure to delight any and all young garbage truck fans. If you are looking for a well-made, classic toy garbage truck, this metal alloy model from YEDAYS is an excellent choice. 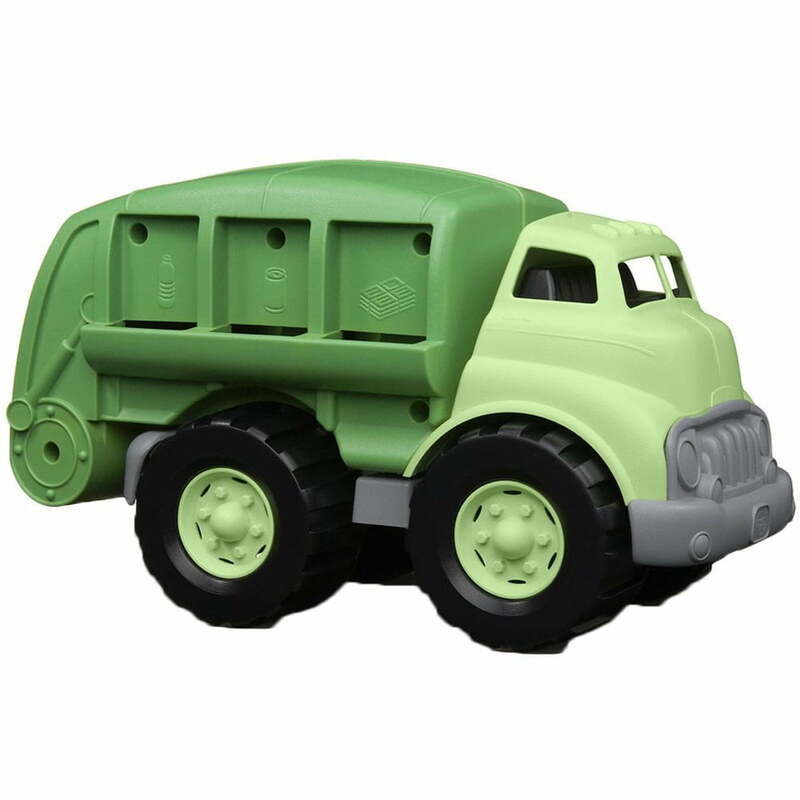 With a bright green dump bed, contrasting with a white cab, this toy garbage truck is as eye-catching as it is fun. With real rubber tires, your child can roll this truck around just like the real deal. The back of this toy garbage truck actually opens up and dumps out. This truck can move without the use of batteries. To utilize the pullback action, all your child needs to do is grab the truck, set the wheels on solid ground, pull back, let go, and watch it go, go, go! 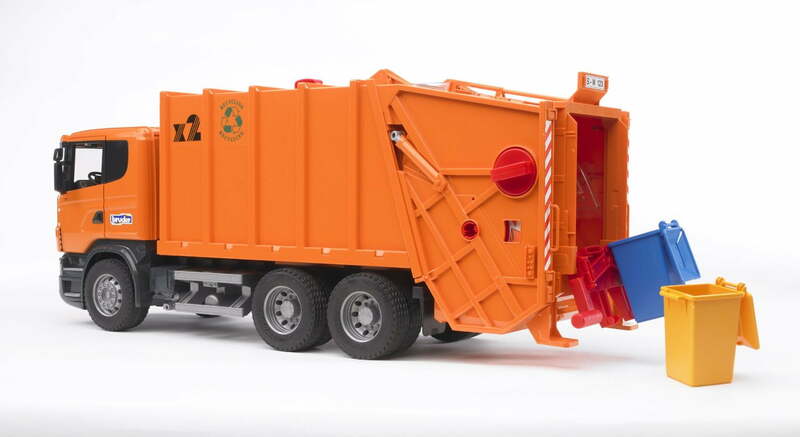 Modeled after an actual garbage truck, this toy truck was designed at a 1:24 scale. Kids love its realistic look and are excited to find this package includes a scaled to size dumpster. Kids can easily lift the front arm to pick up and dump the dumpster, just like the real garbage man does! Kids love this toy garbage truck because it hits the toy truck trifecta- it’s remote controlled, it has working lights, and it makes awesome sounds. Modeled after a construction garbage truck, this toy garbage truck is powered off of three AA batteries and designed for indoor or outdoor use. The front headlights really work. Kids will love taking this truck outside after sunset and watching the lights reflect on the pavement. Suitable for ages three and up, this toy trucks provides hours and hours of entertainment. The remote control allows children to move the truck both forwards and backwards, as well as from left to right, giving them full range motion. A knob on the side of the truck allows them to dump whatever they want to load in there- small toys, shredded paper, or rocks. The top lights not only light up but they also play different sounds and songs, which kids love. 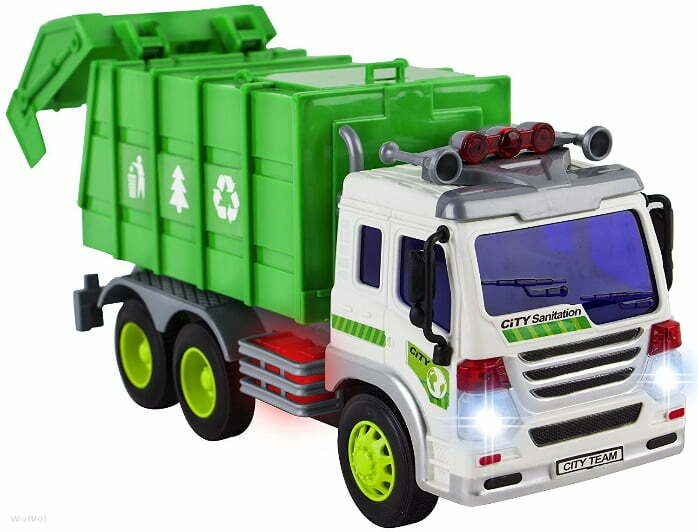 With lights, sounds, and remote control action, this toy garbage truck is a great purchase. 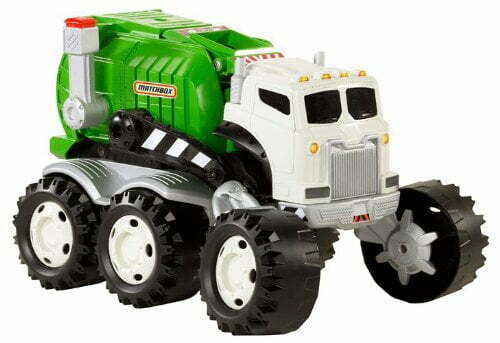 This German made toy is the cream of the toy garbage truck crop. The orange fronted toy garbage truck is very realistic. The working grappler arm lifts and unloads each of the two included garbage bins into the body of the truck where screw extruders then move the contents to the back. The tires on this truck have real tread, mirrors that fold, and a lift gate that not only opens, but also locks into place. The body of the truck lifts up and opens so your child can dump out its contents and repeat the whole process, again and again. 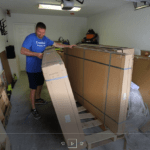 Made to last, this truck is constructed of fade-resistant, high quality ABS plastic and there are absolutely no screws or glue used in its construction. 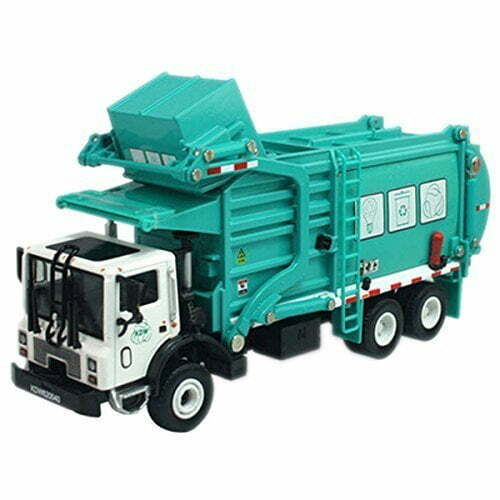 This toy garbage truck is a great inside toy but it is made to be durable enough for outdoor play as well. Stinky The Garbage Truck is one of the coolest toy garbage trucks on the market and would make a most excellent gift for a young garbage truck enthusiast. This toy garbage truck does it all. It talks, eats, dumps, and slings! Part of Mattel’s Big Rig Buddies line, this toy truck is so much fun, even the parents will want to take a turn playing with it. Stinky the toy garbage truck says over 90 phrases and songs, some very business-like, and some hilarious and playful. This garbage truck will tell your child it is hungry for trash- it’s grill acts as a mouth and your child can feed it small items that can later be dumped out of the back. The trash compartment operates just like a real garbage truck, kids can drop something small in the top and Stinky will dump it out of his back door when they pull on the smoke stack. This truck transforms into an upright position, making him look more like a robotic friend than a regular toy garbage truck. As a bonus, this toy garbage truck comes with a Matchbox Big Rig Buddies DVD that transforms your child’s toy into a character who goes on big rig adventures and learns about teamwork, friendship, and being a helper. 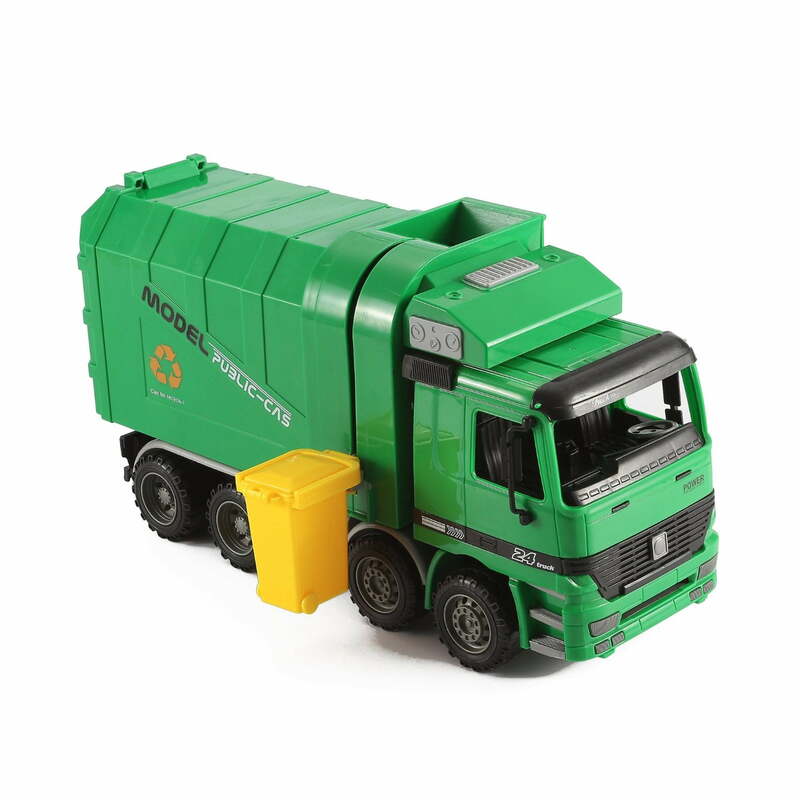 Designed for kids three and up, this is one of our favorite toy garbage trucks on the market. Behold, the most coveted toy garbage truck on planet Earth. This is the big mamba, the most beautiful, detailed, and fun toy garbage truck you can find. Made to look exactly like a Mack Garbage truck, this German made toy garbage truck’s cab is a cheery ruby red and its back dump is a bright garbage green. Kids can easily open the hood of this toy truck to reveal an extremely detailed engine replica. The doors to the cab fully open to a very realistic interior. Each one of the six tires have actual tread and are ready to roll all over the house and yard. The back tilts, lifts, and opens and this toy garbage truck has a real working press so your child can compact trash just like the real garbage man they so admire. This set includes two toy trash bins, one yellow and one blue, that can be filled, attached to the truck, and dumped into the back container. At this price point, this toy garbage truck is definitely an investment piece, sure to last through all the years of childhood and then some. Bookmark this handy guide as you continue on your quest to find the best toy garbage truck for the child in your life. Toy garbage trucks can be great conversation starters providing a chance to open a dialogue with children about the impact of our waste and the importance of recycling. If a toy can stimulate the imagination, initiate important conversation, and provide hours of independent entrainment, then it is a purchase you can be proud of. Garbage trucks are one of kids most favorite sights and they will surely enjoy any replication you give to them. Garbage men often play heroes roles in children’s lives and serve as role models. Encourage their curiosity and give them a toy that will last for years. Any of these toy garbage trucks would make excellent Christmas gifts, birthday presents, or even a just-because sweet surprise.